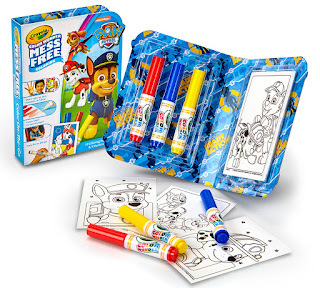 Ideal for mess-free coloring wherever you are, Crayola Color Wonder On-The-Go sets, allow kids to fully express themselves without making a mess. With its compact size and ability to snap shut, this kit lets kids get creative no matter where they are! Crayola Color Wonder On-The-Go titles draw inspiration from popular franchises and characters including Disney Princess, Shimmer and Shine, PJ Masks and Paw Patrol. This product includes 15 mini coloring pages and 3 Color Wonder markers. Each set retails for 4.99 an GREAT for Easter Baskets! Look for them at most retailers! Our family loves Color Wonder!